On a cold rainy night in Strawsbrough town, Melissa and Alfred are celebrating their first wedding anniversary. An old woman tricks Melissa into wearing a cursed ring that makes her go into an everlasting sleep. You play the role of Alfred in this magical adventure, meeting many of the residents of Strawsbrough town in an effort to undo the curse. Find the fortune teller Zulaikha, the town’s mayor, a sad clown, a blacksmith, a miller, and many more as you use magical potions and cast spells in Tales of Sorrow: Strawsbrough Town! The Strawsbrough Town is where you and your lovely wife live. One the day of your anniversary, an old woman appears at your door. As a reward for your hospitality, she presents your wife, Melissa, with a ring. Upon wearing it, your wife falls into a deep sleep and the old woman dissapears. It is up to you to unravel the curse and discover the dark secret that only the townsfolks know. 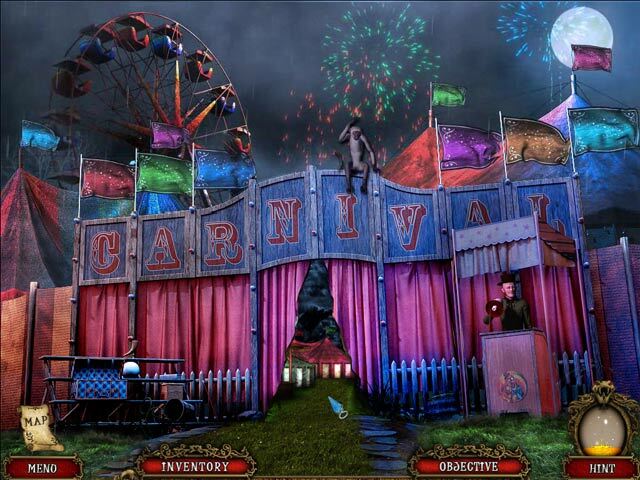 Actually, the story is a bit reminiscent of Snow White meets Sleeping Beautiful and you will meet some very colorful characters on your journey through the town of Strawsbrough.This is a very HOPA with surprisingly crisp graphics. There are live like characters supported by brilliant voice overs. The art work is at times stunning and I really did like the overall look of the game. Unfortuately I cannot say the same for the music, a bit daunting and does get on your nerve after a while. There are two game mode options to choose from. Game features an inventory list, a objective list and a map that is NOT interactive; so be prepared to walk around alot. There are a lot of venues to visit, alot of people to talk to and many HO scenes to work out. The HO scenes are relatively easy and are not interactive which is disapointing. 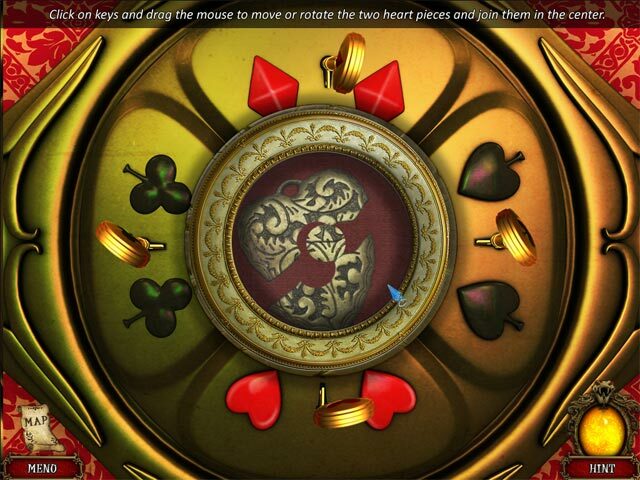 The mini-games are relatively easy to do but were fun at times. There is a unique hint system which everyone will appreciate, a walkthrough is supplied everytime you hit the hint button. The game is looks to be fairly long according to the map, however I do have to say, I did find the game mechanics a bit cluncky and slow. The dialogues are a bit slow, movement is slow and there is an overall slowness to the game. By the end of the demo trial, my patience began to wane. It is a nice game to look at and gameplay is relatively easy so newcomers will enjoy the adventure part as well as the HO scenes. The game did not throw me over but it does seem to be a relaxing game to play on a lazy Sunday afternoon and I have to admit, my curiososity is piqued at discovering the secret behind the town of Strawsbrough. I enjoyed this game. the talking was too slow which was the only frustration. otherwise. it was different I thought. you have to stop the curse on the town. not original but lots of going here and there, finding was not to hard, the hint sign told you where things were if you couldn't find it since some items were a bit dark. other fun things like clowns, you become invisible at the end, making special potion powder. all in all I enjoyed it. I don't use sound so can't rate that but i recommend that game. I really enjoyed this game. It was just challenging enough and held my interest. I wish it had been longer! Highly recommend for anyone who likes to enjoy a stress free game. Graphics were beautiful. Loved it. Stunning details and captivating story. IF YOUR VOLUME IS UP YOU WILL TRULY GET THE FEELING...YIKES!! LOUD IS GOOSEBUMPS*** THINGS ARE HIDING FROM YOU...STAY FOCUSED, THIS IS DIFFERENT, LOTS OF SNAKES,UGH! !, SPOOKY PEOPLE, ALSO THEY ARE UGLY! 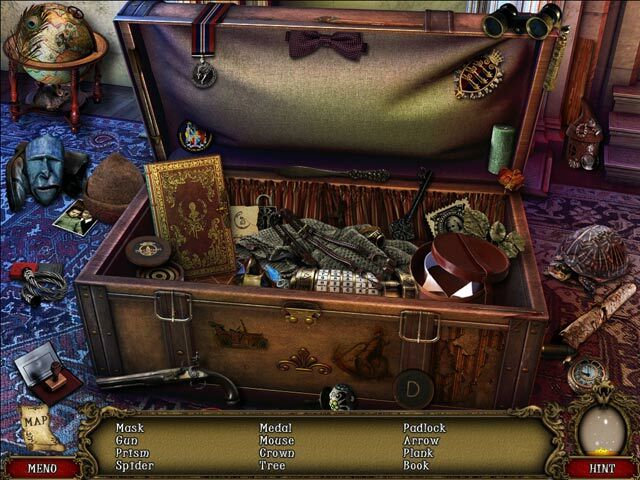 CLUES ALL OVER, STAY ALERT, DON'T POOH POOH THE HIDDEN OBJECT SCENES,there are many,they are a different style, but, within THEM are CLUES and more clues for later, but can you SPOT them? FOCUS, READ, and watch everything. not much running around, but that doesn't mean it's easier. The HINTS are new and different. I was totally surprised when i hit the HINT BUTTON!! I wanted to see how well it worked. SURPRISE!!! You must READ, be patient, READ!! It tells you what you need to know. Be sure and always LOOK UP^^ Everybody talks to you and the story is right on cue. So LISTEN to their VOICE and what they say. Graphics, colors, action, tools, are all GOOD. Perform well. The PUZZLES were not difficult, kind of, but were part of what you needed to acquire items. So give it a good try and you will beat it. Its not a long game but a new experience in performance and playing. I LIKED PLAYING IT!! I LIKE DIFFERENT. THEY DID A GOOD JOB ON THIS GAME AND I DID NOT FIND ANYTHING WRONG...WELL except the batteries on my mouse went DEAD at an inappropriate time, with unacceptable results. TUCHE~!! a fun game :)afor everyone!! Not big on Carnivals but not that much of it to annoy. Just really like the interaction with characters, and there so well done, awesome. I'm a sucker for Rain and Thunder, the scenes are perfect. Can't wait for another game from these people! There are a couple of small thing's though one: need more areas and two the hidden object part seem more childlike compared to the game itself. Hurry and make a NEW GAME! This game has an engaging story, it may have been done before, but it is told with great characters, good graphics and voice over, making it endearing and refreshing. The best thing about it really is the characters, combined with beautiful graphics. I would have given it 4 stars due to some flaws, but I am surprised that it has only rated 3 and believe it deserves a boost in ratings. The flaws are a widescreen function that doesn't work, and some HOS where the objects are impossible to find. The puzzles range from fantastic to mediocre. Another flaw is that it is too short, but in a way it leaves you wanting more, rather than being bored and looking forward to it ending, like a lot of games lately. Overall, it had a good combination of HOS (not too much), cut scenes, and adventure to suit my taste. Well done developers, and I hope to see more like this soon. Played 30 minutes casual - 2 modes, casual and hard - Objectives show at the bottom of the screen - Inventory as well - Map - Voice overs - Clear H0 (a lot of them). You don't interact - Mini games : if you want to skip you have to click on the hint button - Outside H0 the hint turns into a mini SG, giving your instructions - Good graphics - Interesting story if nothing too new All in all a nice little game, will spend a punch card credit on it. Nothing over thrilling but it can be quite enjoyable.